Time sneaks up on you “during” the holidays. One day you’re enjoying Thanksgiving turkey, and the next day you’re trying to figure out where exactly you’re going to come up with the decorations to transform your house into a festive nest. This year, I decided my home was worthy of something much more original than your run-of-the-mill wreath. So I rummaged around the house for things I already had; things that you could easily transform into Christmas door decor. Here’s what I found. 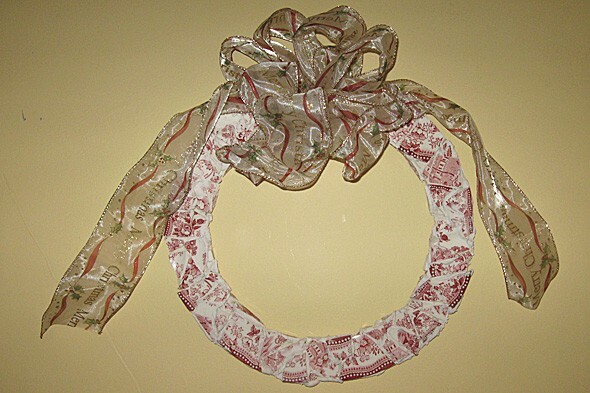 To make this wreath, you need a flat, floral wreath form, some ceramic tile adhesive and a putty knife, a paper bag and a hammer and some broken china. Place larger pieces of china in the paper bag and use the hammer to break them gently into smaller pieces that you can use for your wreath. (Use caution when cutting and handling the China). Before using adhesive, work the pieces into a pattern that covers the form and fits together a little like a puzzle. Once you’ve got the China in the perfect pattern, carefully remove the pieces and arrange them around the form. Then spread the tile adhesive onto the wreath form thick enough that you can press the pieces into it to secure them in place. Trying to keep your original pattern intact, press the pieces of china into the adhesive. Once you’ve got the China in the perfect pattern, let the wreath dry for about twelve hours. Don’t forget to add a bow before you hang it up! When I’d completed my broken china wreath, I thought, there must be other things around here that I’ll never use again. I snooped around the closets and found feather boas from past Halloweens. Really, will I ever use them again? If you have little girls who’ve outgrown their dress-up clothes, you might find some forgotten feather boas in their closets too. Take a look at how I transform a few feather boas into a wreath in minutes flat. You need two or three feather boas, a Styrofoam wreath form and some greening pins which are a “U” shaped pin that you can get in the floral department of your local craft store. Then start wrapping the feather boas around the wreath. Secure one end of the first feather boa with a greening pin. When you get to the end of the first feather boa, repeat with the second, and then the third if you need it. 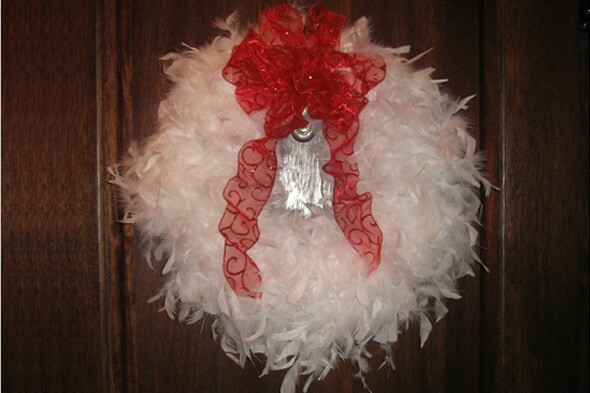 Once the feather boas are completely covering the wreath, use another greening pin to secure a ribbon to the wreath. That’s all it takes for this totally glam feather wreath! See, who needs boring old winter greenery when you can reuse cast-offs from your home to make glam wreaths that will wow your holiday guests? 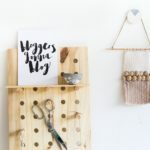 It just goes to show, use your imagination is your best decor tool. Happy Holidays!